Other knowledgeable official sources with direct knowledge and who requested anonymity confirmed to The Daily Caller News Foundation diGenova’s description of surveillance reports Rice ordered one year before the 2016 presidential election. 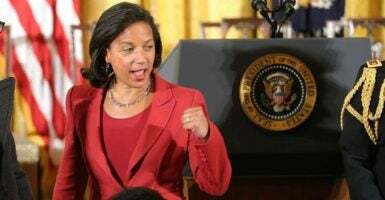 Also on Monday, Fox News and Bloomberg News, citing multiple sources, reported that Rice had requested the intelligence information that was produced in a highly organized operation. Fox said the unmasked names of Trump aides were given to officials at the National Security Council; the Department of Defense; James Clapper, Obama’s director of national intelligence; and John Brennan, Obama’s CIA director. Joining Rice in the alleged White House operations was her deputy, Ben Rhodes, according to Fox. Retired Col. James Waurishuk, a National Security Council veteran and former deputy director for intelligence at the U.S. Central Command, told The Daily Caller News Foundation that many hands had to be involved throughout the Obama administration to launch such a political spying program.